Since 1905, HGU New York has been welcoming guests to its stunning Beaux-Arts building and breathtaking rooms and suites. 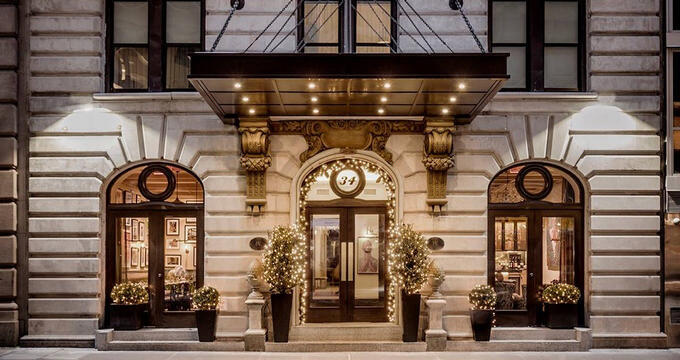 It's one of the finest hotels in NYC and also has the amazing advantage of being located right in the heart of Manhattan, just a couple of blocks away from key landmarks like the Empire State Building. Perfectly located for trips around the Garment District, Midtown, Central Park, Greenwich Village, and more, HGU New York is an idyllic base for NYC exploration and offers a wide range of room types, amenities, and additional features designed to ensure that every guest has the most satisfying stay every time. As well as being one of the closest NYC hotels to the Empire State Building and many other landmarks and monuments, HGU New York also has a lot of luxuries and features to boast of, including its many spectacular rooms. Rooms can be found at HGU New York in a variety of styles ranging from standard queens all the way up to king suites. -Queen - The standard Queen rooms are the simplest and most affordable option for guests at this luxury NYC hotel, but they're anything but simple when it comes to style and comfort. Equipped with a minibar, queen-sized bed, desk, armoire, HDTV, safe, luxury bath products and cozy bed linen, these rooms are always a great choice. -Queen Deluxe - The Queen Deluxe rooms at HGU New York take things up a level by offering more floor space to spread out and feel even more comfortable and at ease in your NYC hotel room. You'll find beautiful robes, high quality bath products, a luxurious bed fitted with your own personalized choice of pillow, and much more. -King - The standard King rooms at HGU New York are perfect for those in need of a large bed than the Queen rooms can provide. You'll find a full king-sized bed in these rooms, as well as all the other amenities and features that come as standard in all HGU New York rooms like a HDTV, plush robes, CO Bigelow bath products, a full-size tub, and more. -King Deluxe - The King Deluxe takes the standard King room and increases its size and volume, offering a lighter, airier, larger space for you and your fellow travelers to stretch out and feel totally at home. As in all other rooms, you'll be able to enjoy free Wi-Fi and wireless charging solutions around this room for all your gadgets. -King Suite - The King Suite is the ultimate room type at this deluxe NYC hotel. Much more than a standard room, the King Suite is like having your own private, luxury NYC apartment. It features a large living space separate from the bedroom area, letting you relax on a comfortable sofa, which can also be converted into a queen-sized bed, making this suite a great choice for families or small groups of friends. Like any leading hotel, HGU New York Hotel is home to its own incredible restaurant for guests to enjoy. With a highly trained team of kitchen staff making use of only local ingredients and fresh, seasonal produce throughout the year, the Restaurant at HGU serves up a range of classic American fare, cooked and prepared to the highest possible standard. Those looking for more of a relaxing, bar-like space to hang out with friends and fellow guests can visit the accompanying 1905 Lounge, a beautiful cocktail bar set beside the Restaurant at HGU and offering a chic, contemporary chillout space with comfortable seating, atmospheric lighting, and inspiring artwork on the walls. -Top quality toiletries - All bath and shower products in the rooms at HGU New York are provided by CO Bigelow, one of the oldest and most trusted cosmetic companies in America. -A pillow for every occasion - You can check out a full pillow menu while staying at HGU New York and choose the pillows to suit your preferences and style of sleeping, with various degrees of softness and firmness and multiple materials to choose from. -In-Room dining whenever you like - HGU New York offers in-room dining 24 hours a day, with meals and snacks provided by the Restaurant at HGU. You’ll also find a mini-bar in your room stocked with high quality drinks and treats. -Full concierge service - HGU New York offers full concierge services for all guests. All you need to do is head down to the lobby or call up the concierge to request a wide variety of services including everything from dog walking to restaurant reservations. -Meditation - Slip into a state of total relaxation with the 'Center of the Cyclone' immersive meditation sessions at HGU New York. Available for small groups or individuals, these meditation classes will help you attain a new level of inner peace. -IV infusions - REVIV IV infusions are available at this incredible boutique NYC hotel as well, with a good selection of therapies available stocked up with nutrients and vitamins of all kinds to cure what ails you and give you a much-needed energy boost before you set off around the city streets of NYC. -Work out - HGU New York is one of the few luxury NYC hotels to have a full partnership in place with a gym next door. Solace New York is located right by HGU New York and lets guests enjoy premium group workout sessions and private one-on-one classes as needed. All of these services, complete with the excellent dining options and superb rooms available at HGU New York help to make this location one of the premier boutique hotels in NYC, so book your stay today and start seeing why so many people adore this hotel.